Many of us love cookies. They’re sweet, they’re crunchy and they’re full of tasty ingredients like chocolate, nuts, and butter. Although most cookies rate pretty low when it comes to nutritional content, having a few now and again won’t hurt you—or so we thought. Because only eating a few cookies every now and then can actually be a real challenge for some people. Take one popular brand, for example. Oreos seem pretty benign in the world of desserts. Certainly, there are decadent treats that are far more fattening. After all, an Oreo is comprised of two simple chocolate wafers with a small portion of creamy icing in between. Eat one Oreo and you will probably find yourself reaching for a second one. And maybe a third, or a fourth, or a fifth. Now you may have a bit of problem. You’ve just ingested far more refined sugar and processed white flour than you intended to eat. Why didn’t you stop at just one cookie? Well—it might not be entirely your fault. It may not be that you’re particularly weak-willed when confronted with a whole bag of Oreos. Believe it or not, those cookies could be more addictive than cocaine. That’s the conclusion a group of scientists from Connecticut College in the U.S. came to. According to the researchers, your brain likes the ingredients in Oreos even more than it would the highly-addictive, high-inducing drug cocaine. The researchers performed their study on rats. Two tests were set up. One involved a saline solution and a cocaine or morphine injection, while the other involved rice cakes and Oreos. When the rats were given the saline solution, they continued to move about and behave in a normal way. However, when they received the cocaine or morphine injections, they stayed put in one place. When the researchers conducted the rice cake and Oreo test, not surprisingly, the rats showed little interest in the rice cakes. When stumbling upon the Oreos, however, the rats were content to stay near the cookies. It seems the rats liked the “high” they got from eating the cream filling in the cookies, in the same way that they seemed to crave more of the cocaine and morphine. 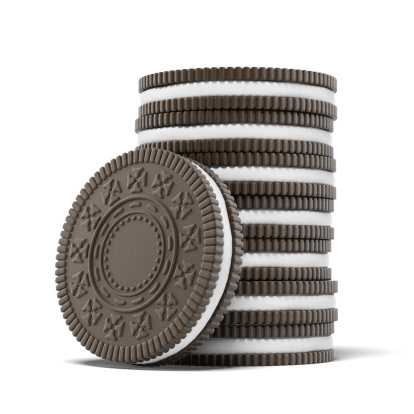 Here’s where the study gets interesting: when the researchers measured the expression of a particular protein in the rats, they found that the Oreo cookies activated more neurons in the pleasure center of the brain than the cocaine or morphine did! This is yet more evidence about the addictive power of foods high in refined sugar and fat. These foods offer nothing in the way of nutrition but manage to trigger instant gratification when we eat them. Unfortunately, the feeling doesn’t last long and we have to eat another one. Eating highly addictive foods can make it extremely challenging to stay healthy. Eventually, too much sugar and the wrong kinds of fats will usher in symptoms of diabetes, heart disease, and metabolic syndrome. Do yourself a favor and make some of your own Oreos at home with healthier ingredients. Use cane sugar or honey to sweeten the batter and whole grain flour in the mix. Verner, A., “Oreos more addictive than cocaine, study finds,” The Globe and Mail web site, Oct. 16, 2013; http://m.theglobeandmail.com/life/the-hot-button/oreos-more-addictive-than-cocaine-study-finds/article14885780?service=mobile, last accessed Oct. 17, 2013. “Student-faculty research shows Oreos are just as addictive as drugs in lab rats,” Connecticut College web site, Oct. 15, 2031; http://www.conncoll.edu/news/news-archive/2013/student-faculty-research-shows-oreos-are-just-as-addictive-as-drugs-in-lab-rats-.htm, last accessed Oct. 17, 2013.